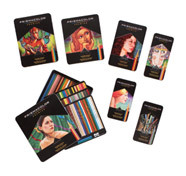 Artists' quality colored pencils for every level of expertise. High quality pigments for a rich color saturation. Soft, thick cores create a smooth color laydown for superior blending and shading. Thick leads resist breakage.